Bike Weekender is here to offer your club or group a hassle-free weeklong tour or long weekend cycling in France, with first-class riding, panoramic scenery, exceptional hospitality and the chance for your club to simply relax, socialise, and above all, ride. Unlike many operators who are fixed to offering only one location and accommodation, we are able to provide so much more. We can arrange short breaks, weekends and longer weeklong tours for cycling clubs and other groups of 6 or more throughout the summer months, from May to September. We offer a wide range of locations across the French Alps, Provence and Mediterranean Coast, with accommodation and riding tailored to suit precisely what you’re looking for. For larger cycling groups of 20 or more, we can arrange exclusive use of our home base, the Aravis Lodge, on the edge of the pretty ski resort of La Clusaz – just 1 hour’s transfer from Geneva airport. This is where Bike and Ski Weekender were born, and it’s where we’ve developed our highly praised short break format. Everything about the Lodge is set up to make a cycling trip as effortless as possible – off the saddle at least! Bike facilities (secure storage and workshop), leisure facilities (sauna, massage room, gym) and social facilities (lounge, TV room, large licensed bar, garden and terrace) all combine to make this a relaxed, welcoming and comfortable home-from-home. It really is the perfect base for a truly memorable custom cycling holiday. The Aravis Lodge is just an hour’s transfer from Geneva airport, which means that it’s possible for your group or club to pack in a lot of cycling, even over the course of a short 3 or 4 night break. The Lodge is right in the heart of the Aravis Mountains and close to beautiful Lake Annecy, making a wealth of incredible alpine and lakeside riding available, right out the door. 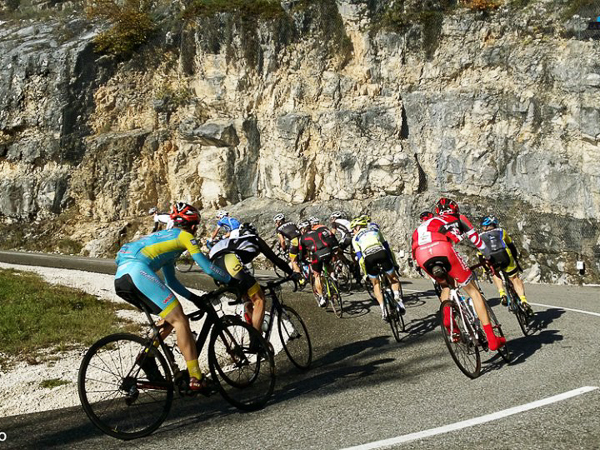 The Tour de France is a regular visitor to the area and in 2016 it passed right by the Lodge. Pit yourselves against famous Tour de France cols like the Aravis, Colombière, Croix-Fry or Forclaz, or take a more leisurely approach on the 2009 time-trial route around Lake Annecy. So, if you have a group of 6 or more looking for an amazing break, let us know your requirements and we’ll work with you to arrange your perfect club or group cycling holiday. Planning a Group or Club Road Cycling Holiday?